Feds milk it for all it’s worth. Last month, federal agents struck. They went in harm’s way at no small danger to themselves just to protect us. Federal agents watched the home closely for a year, gathering evidence. Then, in a pre-dawn raid, armed members from three agencies swooped in. No, this is not a retelling of the lightning U.S. commando attack in Abbottabad, Pakistan, that killed terrorist leader Osama bin Laden. Rather, the target of the raid late last month by U.S. marshals, a state police trooper and inspectors from the Food and Drug Administration (FDA) was Amish farmer Dan Allgyer of Kinzers, Pa. His so-called “crime” involved nothing more than providing unpasteurized, or raw, dairy milk to eager consumers here in the Washington area. 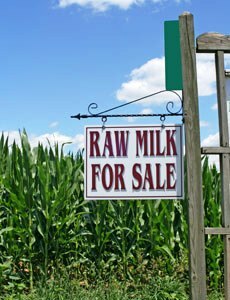 Is raw milk dangerous? I don’t know. The best butter I ever ate (and I ate lots of it) was home-churned in the mountains of rural south-western Virginia where my parents and I visited my grandparents back when I was a kid. Only eleven of the fifty-seven states ban the sale of raw milk, lots of people think it’s good for them and lots of them drink it. A dairy company in Fresno, California sells raw milk legally at 400 markets but cannot ship it across state lines without risking action by the FDA. That’s horrible! What can the FDA and USDA be thinking when they permit these outrageous health hazards to continue? Shouldn’t everything we eat, drink and otherwise consume be prepared in federally regulated facilities? Damn the cost! Full speed ahead! Don’t we deserve the very best and healthiest our all-wise government can impose upon us? Clearly, we common folk lack the basic competence to make decisions for ourselves; we are helpless. We demand victim status and all of the goodies that entails. On May 16th, there were protests at Capitol Hill, obviously by a special interest, astroturfed herd of racists. Aren’t warning labels effective? It’s difficult to find any product lacking them and they are so very instructive: Do not stick your fingers in the blender while it is working; injury may result. That’s something most of us would not understand without governmentally required guidance. If not effective, more and therefore better regulation is clearly needed. Is any of this a big deal? Maybe not taken alone, but it’s not alone. The federal government now regulates school bake sales, substantially dictates what is taught and how in our schools, requires the purchase of medical insurance and prescribes what has to be covered, enforces “green” energy policies principally for ideological reasons, strips and gropes very young children and others in politically correct fashion at airports to keep us safe from Methodist clergy intent upon Jihad, tells businesses where they can’t have factories and where they must have them in order to make labor unions happy, and is quickly becoming all pervasive. There is something rotten, and not only in Denmark. Oh the horror, the humanity!!! Something has got to be done about those crazy Amish (and everybody who trades with them)!! !